San Ging, Translating to "Mountain View", is an architect-designed detached self-catering holiday let situated in an elevated location on the edge of the town centre of Keswick. The property has stunning views over Keswick, the nearby Northern Lakeland fells and Bassenthwaite Lake. This premium self catering property for up to 8 people offers stylish 4 bedroom accommodation and combines special features with spacious living areas ideal for groups of family or friends. San Ging is very well equipped to ensure your stay is comfortable and enjoyable. Bedding provided. Free Wifi. Parking. 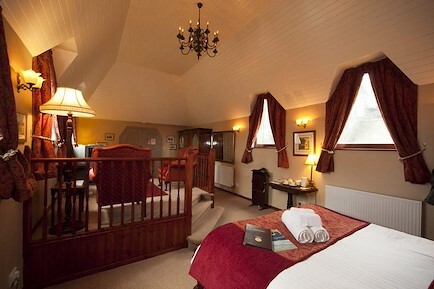 Mid-week and weekend breaks available. Spa membership included. Accommodation comprises: 2 double rooms, twin room, bunk room, 2 bathrooms (one ensuite), additional toilet, lounge, sunroom, dining kitchen, utility room, garage, patio. San Ging is situated approximately 0.75 miles from Keswick town centre. From the M6 motorway: Turn off at Penrith and follow the A66 West towards Keswick (approx. 15 miles). Take the first turning into Keswick and drop down the hill, past the Keswick town sign and on to the t-junction. Turn left up Chestnut Hill and after approximately 300 yards there is a left turn into an (unnamed) cul-de-sac. San Ging is the second house on your right. Your enquiry will be sent directly to San Ging. Please fill in as much detail as you can.